The Recycling and Economic Development Initiative of South Africa has received quite a bit of press in AutoForum, and for good reason. The initiative has only been in existence for 3 years and has certainly made good ground in building a viable and sustainable waste management industry focusing on tyre recycling, having hosted a recent panel on its role in the circular economy at the 2015 Global Economic Symposium amongst other acheivements. But the project is also proud of the individuals who are benefiting from its existence. 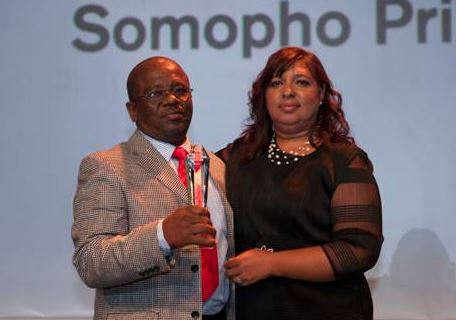 Fanile Mbanjwa from Somopho Primary school in Empangeni, in KwaZulu Natal is one of those people. The school has taken the initiative to start their own tyre recycling projects, once of which includes developing a successful tyre vegetable garden – and the results are being realised as the garden provides food for the 1600 students in the school. Mbanjwa explains that he was fascinated by how the REDISA Plan is solving an environmental problem, while at the same educating people about the environment and giving previously disadvantaged people an opportunity to make a decent living. This enthusiasm led to Mbanjwa being recognised for the work he has achieved at the inaugural REDISA Recognition Awards. The school received the award for having made a significant contribution to the promotion of, and realisation of a sustainable recycling business; bringing to life the REDISA ‘Waste into Worth’ concept. Ultimately, by formalising an informal sector, REDISA believes it is providing the prospect of full participation in South Africa’s economy to many, and finding the value in waste. “We are most proud of the impact the initiative has made to the many people both employed by REDISA, and supported in terms of secondary industry,” says REDISA Director, Stacey Davidson. REDISA aims to create a steady balance between government requirements, environmental sustainability and industry ambition, through its waste management system by contributing to the economy and creating jobs in the process.